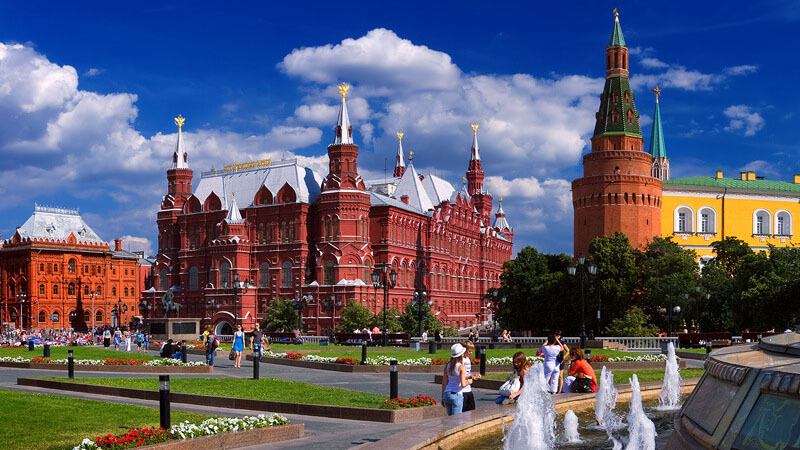 With its broad sidewalks – тротуары (trotwaree) and painted facades – фасады (fasaadee), downtown Moscow (tsentr Moskvy) has morphed into a great place to go for a stroll – прогуливаться (pragoulivatsa). It is also the intersection for a variety of architectural styles – архитектурные стили (arkhitektournyé stili). Let CREF take you on a journey through time to get you better acquainted with the city. It’s easy to pick out the quintessentially traditional in Russian architecture: roofs that are steep and multi-faceted – многогранный (mnagagrannyi). Another hallmark: the “shatyor” – шатëр, a pyramid-like structure that crowns not only the Kremlin’s peripheral towers, but also numerous other ancient towers – часовни (chasoavni). The oldest stone specimen can be found on the Church of the Ascension in Kolomenskoye Park (built in 1532). One can encounter Russian residences characteristic of the 16th century – палаты (palaaty) sprinkled around Moscow: squat houses painted white, with small windows – окна (oakna) and gray-tiled roofs – крыши (kryshi), like in Varvarka street, or like those from the Romanov era near the Red Square. The churches – це́ркви (tserkvi) from the 18th and 19th centuries are almost always in the neo-classical style, adorned with columns – колонна́ды (calanady) and pediments – фронто́ны (frantony). At the time, the style was widespread throughout the country, maintaining a strict uniformity. Meanwhile, the rules – правила (pravila) that govern religiously inspired architecture are no less subject to the symbolism of Orthodoxy – православие (pravaslavié). For example, the color of the bulb-shaped domes – лукавичные купола (loukavitchnyé kupala) carries special meaning. Domes that are blue and dotted with stars – звëзды (zviozdy) indicate that the church is dedicated to the Virgin Mary – Богородица (Bagaroditsa). The stars, meanwhile, represent the star of Bethlehem – Вифлеемская звезда (Vifleemskaya zvezda). The green domes indicate that the church is dedicated to the Trinity – Троица (Troïtsa) or to a particular saint (the color gray is also sometimes used for saints). Gold signifies purity – чистота (chistata) and eternity – вечность (vetchnast’). Black is reserved for churches housed in monasteries – монастыри (manastyri). The number of domes is also significant. For example, a single dome symbolizes the Holy Spirit, whereas five domes represent the four evangelists and the Saviour – Спаситель (Spassitel’). Architecture is also about the unseen, like the simple fact that bridges – мосты (musty) and buildings – cооружения (saarouzhénia) should be safe from collapse. In the 19th century, a city planning office was set up to manage all the buildings in the country; it was supervised all through the century by engineers – French engineers from France’s Grandes Ecoles (Great Schools). A hallmark of the French engineering method is the requirement to test for material durability – прочность материалов (prochnast materialov) before undertaking any large-scale construction work. This might explain the complete absence of construction-related accidents – отсутствие строительных инцидентов (atsotstvié strayeetelnikh intsidyentov) in Russia, ​​while the United States and Great Britain have witnessed noteworthy setbacks, even as late as the 1940s, for example, with the well-known Tacoma Narrows Bridge collapse. Some particularly large high-rise buildings with somber facades were actually rental properties – доходные дома (dakhodnyé damaa): they were leased out for rent – доход (dakhod). They were often built by corporations in the 19th century and typically sported several “parade” entrances – парадный подъезд (paradny padyézd) leading into the street, as well as service entrances – служебный вход (sloozhebny vkhod) from the courtyard – во дворе (va dvarei). The building which houses CREF was built by an insurance company towards the end of the 19th century. Fyodor Shekhtel – Фëдор Шехтель was the architect behind some of the most beautiful examples of “art nouveau” – стиль модерн (stil madern) in Moscow, including Gorky house and the Yaroslavsky railway station, the latter forming part of Moscow’s Three Station Square. Considered an innovator at the time, he would soon be forgotten during the Soviet era. The Soviet avant-garde of the 1920s, meanwhile, was characterized by “constructivism” – конструктивизм (konstrooctivizm). The Chistye Prudy station, near CREF, is a good example of this style. Constructivism stresses the use of simple geometric shapes – геометрические фигуры (geomotreecheskié figoory) and emphasizes functionality. The Stalin era left behind several examples of monumentality – монументальность (monumentalnost), starting with the Moscow metro. No longer was it about sober lines and simplicity in form; in their stead a debauchery, almost Roman in taste, of symbols of antiquity – символы античности (simvoli antichnost) with a Soviet twist. Quality materials, imposing sculptures, nothing was too big or beautiful to sing the praises of the system. Moscow is also home to the seven “Stalin towers” – сталинские высотки (stalinskyé vissotki), the largest of which houses Moscow State University. If you would like a tour, make sure to bring along good walking shoes! It was also during the Soviet era that entire buildings were relocated – передвигать (peredvigat), like Moscow City Hall on Tverskaya Street, in order to widen – разширить (razshirit’) the city’s avenues. In the 1970s, buildings were erected that added glass – стекло (steklo) and concrete – бетон (beton) to the concept of monumentality. The congress center in the Kremlin is one such example; another example is the old movie theatre – кинотеатр (kinatséatr) on Pushkin Square. In fact, there are several movie theatres both in districts further afield, as well as those strewn throughout the former USSR that imitate this style. Meanwhile, the further from the city center one travels, the more frequently one happens upon apartment buildings – жилые дома (zhilyé dama) that appear to be duplicates of each other. Certainly, the tradition of the model plan of churches from the 18th century persists in the form of what in England would be referred to as “housing estates” – жилые массивы (zhilyé massivy) from the Soviet era. In the 1960s, Khrushchev had 5-storey prefabricated buildings constructed to solve the housing crisis. They were supposed to only last twenty years, yet still stand today. The city of Moscow has now begun to replace the famous “Kroushchyovki” – Хрущëвки with enormous twenty-storey buildings, surrounded by parking spaces – парковочные места (parkovatchnyé miesta). A law – закон (zakon) is currently being debated that would replicate this policy across the country. And with that, you’re now ready to discover Moscow with fresh eyes – со свежим взглядом (sa sviéjim vzgliadom)!